Egypt has condemned the "excessive" and "unjustified" use of violence by Israel against the elderly, women and children in the Gaza strip, Al-Ahram's Arabic news website reported. In a statement by the Egyptian foreign ministry, Egypt condemned the death of eight children and the injury of many others caused by an Israeli missile that slammed into a public playground in the seafront Shati UN refugee camp on Monday. 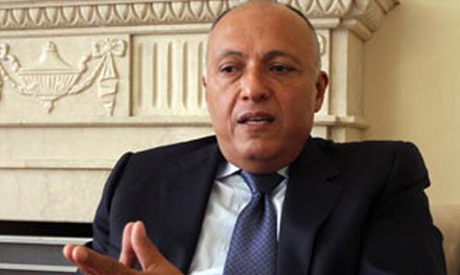 The statement stressed that Egypt is urging all parties to abide by the international humanitarian law and the four Geneva Conventions that stipulate not to target civilians in times of war. It also highlighted that Egypt is recalling for a truce it initially called for last week. The Egyptian proposal was rejected by Hamas, the leading Palestinian faction in resistance to Israel. Meanwhile, Palestinian President Mahmoud Abbas communicated with Egyptian President Abdel Fattah El-Sisi on Monday via a phone call for talks on the continuing attacks on the Palestinian people. According to AFP, figures released Sunday by the UN humanitarian agency, OCHA stated that there have been 999 Palestinian casualties, including at least 760 civilians, among them 226 children. The figures also revealed that 6,233 Palestinians have been injured, among them 1,949 children. Other estimates put the figure of Palestinians killed by Israel closer to 1,100. OCHA also said 215,000 Palestinians had been internally displaced by the ongoing fighting, with the UN agency for refugees saying 170,461 of them had taken refuge in 82 of its shelters. The rest were staying with relatives or friends. The conflict has also cost the lives of 43 Israeli soldiers, all of whom were killed since the ground operation began, as well as two civilians and a Thai agricultural worker who were killed by rocket fire. Since Israel began Operation Protective Edge on 8 July, the Israeli army says it has attacked 3,870 targets in Gaza, and militants have fired approximately 2,000 rockets which hit Israel, with around 500 shot down by its missile defence system known as Iron Dome. Egypt condemns attacks on civilians in Gaza by Israeli terrorist army but keeps the order shut in obedience to the Zionist dictate ? Who are they trying to fool.? Shame on Egypt.